When I first had my surgery, the “bariatric community” was obviously much smaller than it is now. There were a few of the obvious places for folks to connect; obesityhelp.com, bariatricpal.com, and some other smaller forum based sites. Then of course there were the folks posting vlogs on YouTube. Facebook groups and pages heavily dominate the landscape now. I will leave the discussion on if this is a good thing or not for a later date. 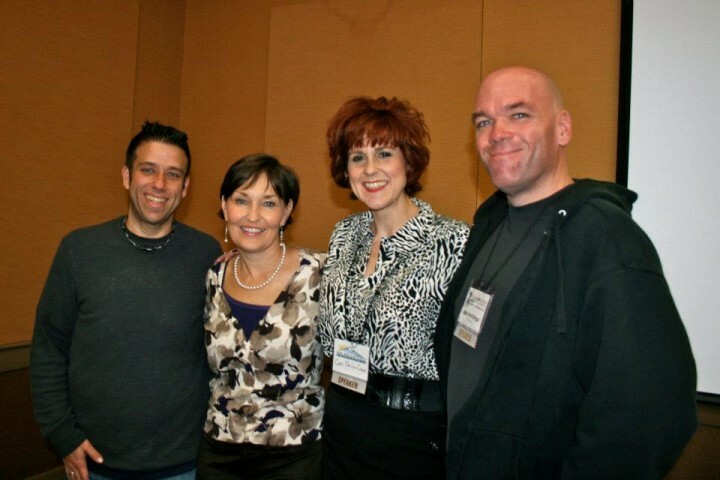 My personal hangout at the time was bariatrictv.com – through that site I built friendships that last to this day. It was through a combination of BTV and YouTube that I ended up flying out to Vegas for the first time ever about 10 months after surgery. Some folks from YouTube decided to organize a little get together that pretty much exploded into a weekend event that included a day of speakers, friendship, sharing and more. It also was the catalyst for the creation of the WLSFA, which carried over the tradition of getting together on an annual basis. It was through this first year and subsequent events that I met a couple of wonderful ladies. That first year, I met Cari, she did one of the first talks… something about sisterhood and pants… sorry Cari, I probably didn’t pay a lot of attention. You, the dude thing and all. It was the following year that I met Connie. Both Connie and Cari are very… genuine people. They were very supportive of me when I did my first speaking gig in Portland a few years back, and while we don’t actually get a chance to see and talk to each other much, when we do it’s always a pleasure, and when ever I’ve reached out, they’ve been more than willing to help me out when and however they can. That’s me with Cari, Connie and Chef Dave in the photo up there. 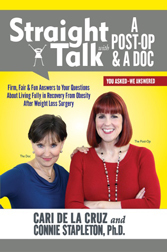 Cari is a post-op herself who used to blog Bariatric After Life, and Connie is a Psychologist who works out of the Atlanta area, and has written a number of bariatric surgery related books (one of which I contributed on). I could get into deeper introductions, but the main reason I am introducing them is because of what they’ve been doing together the last couple years under the moniker of “A Post-Op and a Doc“, or often APOD for short. Together they’ve been doing a lot of work with folks in the realm of weight management, often in the context of addiction recovery. There are a lot of folks fighting obesity where addiction has played a role in their obesity, or addictive issues arise as they work on their getting the obesity under control. And while not everyone dealing with obesity has these problems around addictions, a lot of what Cari and Connie work on with folks can be universally applied. As I said, they’ve been working together for awhile, and with Connie’s history with writing books, I figured it was only a matter of time before the two of them would have one out… and now they do; Straight Talk with A Post-Op and a Doc. When I saw these two in Orlando last fall for Your Weight Matters, Cari asked if I would be interested in reviewing their book. Now, I have to be up front about this part… they did offer me a free copy to use for doing a review. But, that doesn’t guarantee them a glowing review or anything. And they knew that. I was in the middle of another couple books at the time, so they also knew I wouldn’t get to it right away. So finally last month I was able to dive in to it a bit. Cari was able to gift me a Kindle copy of the book, which was nice, cause I could read it on my phone or my tablet, depending on where I was at the time. When I read books like this, I tend to make liberal use of the highlighting features for passages that just connect with me and that I feel I may want to come back to later. There’s a lot of color in this book at this point. I also went in to this a bit different, knowing I was going going to be reviewing it, I wanted to be able to pull some quotes out and such… but the deeper I got in to the book, the more and more I realized… I was doing this wrong. Before you go scanning the table of contents for chapter names, you should know that this book is divided into twenty-two sections, where each section features our answers to your question. Since you don’t have to read it cover to cover, if you’re feeling a bit rebellious, you can start at the end, skip to the middle, then thumb through the pages and pick the question nearest where your thumb ends up! The approach in the things these two have developed is generally about addressing the various problems and issues folks are facing and offering their individual perspectives as a post-op (Cari) and a doc (Connie), giving the insight of someone who’s been-there/done that and someone with the clinical background perspective, who also is dealing with recovery issues. So as mentioned in that paragraph, there’s the various “chapters”, 22 of them actually, where each poses a common question they’ve had people asking them over the years. Then they each present their own “answer” to addressing the question, followed by what they refer to as HoMEWork – particular emphasis on the ME. This is some things for you, the reader to follow up with on your own in addressing that topic for yourself. It’s often by doing some inner reflection, journaling type exercises and such. Things that can help you take an honest look at where YOU are, what your feelings are, and trying to turn some of the negatives we put on ourselves around. Why do I eat without thinking? Why does my past matter? Why do I miss food so much? Why can’t I believe in myself? Why can’t I stop thinking about food? That’s about a third of the questions they look at, some in this book may never apply to you, some may be ones you’re asking yourself right now. Maybe others you’ve faced and been able to answer for yourself already. So while it may be a book you aren’t meant to read cover-to-cover… after getting about half-way through it that way myself… I think what I would recommend is checking out the overall list, you can preview the list by checking it out on Amazon. Hit up the questions that are jumping out at you right now, things you may be struggling with. But make note of those that you feel aren’t a problem yet… and those that maybe you feel you have dealt with already. After you get through those pressing ones, go back and check out the ones you feel you have already dealt with, cause I’m willing to bet even though they’re not a problem for you right now, you may get some additional help from their thoughts, as well as the ME exercises they present. After that, either hit up the ones you didn’t think are a problem, and give them a look through… cause as the weeks, months, years go by… new things are gonna crop up. And maybe being familiar with these exercises and such they put out there ahead of time might help dealing with something new that pops up on you that much easier. In everything they do, Cari and Connie emphasize their “straight talk”. They’re honest, but not… brutally so. They don’t do so as a means of tearing someone down. They do it from a place, of what I believe, is genuine caring. They do so with the idea that sugar-coatings things doesn’t serve to help… it just sort of buries the problem. One of the things that struck me as I was reading this, and maybe it’s because I’ve been fortunate enough to know these ladies like I do, but I could actually “hear” their voices as I was reading. They do a lot of other work, speaking engagements, workshops, lots of online things like their monthly APOD-casts. So I have a strong feeling that I’m not the only one that can hear them in my head while reading this though. I knew I could recommend this book, even before I actually read it. And sure, I know it isn’t going to be everyone’s cup of tea, cause they do have a fairly unique way of working with folks, and if it doesn’t click with you, you won’t get anything out of it. So maybe check out some of the other things Cari and Connie are doing as part of APOD, and if their style does speak to you… then yea, this book will be well worth having on hand. Next story Reset, do over, or just keep moving forward?